Teddy Bear the talking porcupine is back with another video to tell us about munchin' on a pumpkin! We aren't quite sure what he's saying but judging by his general love for food, he's probably saying something good. Teddy Bear is from a traveling wildlife company that educates people about animals. According to National Geographic, there are about two dozen species of porcupines and they are the prickliest of rodents! The porcupine is the prickliest of rodents, though its Latin name means "quill pig." There are about two dozen porcupine species, and all boast a coat of needle-like quills to give predators a sharp reminder that this animal is no easy meal. Some quills, like those of Africa's crested porcupine, are nearly a foot (30 centimeters) long. Porcupines have soft hair, but on their back, sides, and tail it is usually mixed with sharp quills. These quills typically lie flat until a porcupine is threatened, then leap to attention as a persuasive deterrent. Porcupines cannot shoot them at predators as once thought, but the quills do detach easily when touched. 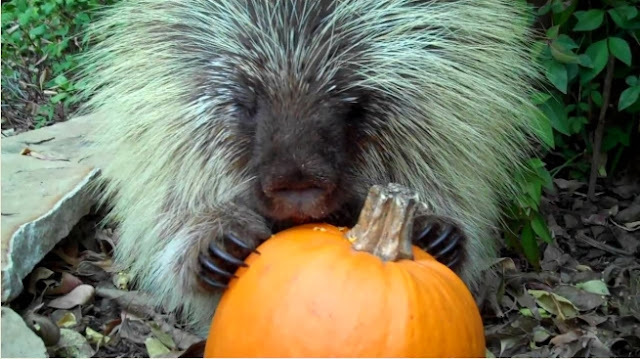 Responses to "Talking Porcupine Tastes His First Pumpkin, Can't Contain His Excitement "
oh my this is sooooooooooooooooo good!!!!!! Hands down the cutest animal video I have seen in a long time! Wow ! He is so cute !! This is THE most adorable precious video ive ever seen! Had to watch an listen several times. One thing for sure is Teddy most assuredly gets his point across! Yes he loves pumpkin an no he dont want to share it! Love it! !